After last year's foray into magic and mysticism, Arrow returns to its roots for the Fifth Season opener. With all of his allies either dead or retired, Oliver Queen (Stephen Amell) is burning the candle at both ends working days as the new mayor of Star City and nights as the Green Arrow. 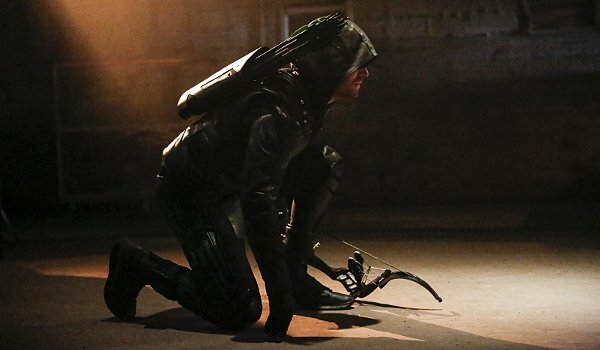 While the recent seasons have created more and more powerful adversaries for Green Arrow to fight, necessitating building a bigger and better team, the season premiere gets back to basics with a street-level villain in Tobias Church (Chad L. Coleman) who kidnaps the mayor in hopes of bringing the Emerald Archer to his rescue. If he only knew. Sure, Ollie still has Felicity (Emily Bett Rickards) working her tech magic, but his cast of supporting characters have moved on from the vigilante lifestyle. Speedy (Willa Holland) suits up one last time to save her brother, but given Ollie's decision to return to some more brutal forms of justice her taste for vigilantism has burned out. That doesn't mean that Ollie will be alone this season. Not only are we teased with the possibility of a new Black Canary, the show also introduces the idea of Green Arrow building up a crew of D-list street-level heroes to help police the city (while working as the mayor to clean up a corrupt police department). The less-than-impressive Wild Dog (Rick Gonzalez) is the first of these would-be heroes introduced, but Vigilante and even a hero-turn for Curtis (Echo Kellum) are teased as well. Just as the main story is simplified in terms of theme and scope, so too are the flashbacks which pick up Ollie's adventures in Russia, his reunion with Anatoly (David Nykl), his introduction to the Bratva, and finally begin to explain his connection with the Russian Mafia which was teased early in the show's First Season. There's certainly some gaps between events on Lian Yu and Ollie turning up in Russia, but I'm in favor of the new direction of these sequences and curious to see where they may lead. I'm far less interested in Felicty's new boyfriend (Tyler Ritter) who I'm betting will either A) turn out to be a corrupt cop, or B) die in tragic fashion. Nor am I particularly looking forward to a new killer archer in the city (been there, done that).